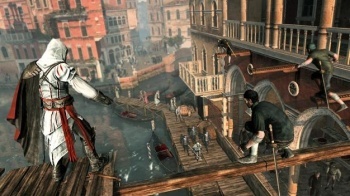 Though the game's only been out for two weeks, Assassin's Creed: Brotherhood will be getting DLC sometime next month. However, this isn't your average DLC, it's the best kind of DLC there is; it will be released completely free of charge. Sebastien Puel, executive producer at Ubisoft Montreal, said, "We wanted to say thank you to our fans for making Brotherhood such a huge success its opening week. We are very proud of the unique and innovative Multiplayer mode it offers, and hope the fans enjoy the new content." The update, called "Animus Project Update 1.0," will introduce a new, harder version of Alliance mode called (creatively) Advanced Alliance Mode, which be an increase in difficulty analogous to Wanted mode's Advanced Wanted mode. It will also include a new multiplayer map, Mont Saint-Michel, which will feature narrow side-streets, a bell tower, and multi-leveled buildings. The DLC will be available Dec. 14.